"We’re here to guide you on the right ship, itinerary and on board lifestyle"
Budapest to the Black Sea. Explore the romantic lower Danube on a Budapest river cruise through the heart of Central Europe, where East and West meet and entertwine in fascinating cultures and turbulent history. Glide past medieval monasteries, citadels and villages... Discover resort towns along Romania’s Black Sea Coast, explore an ancient Christian necropolis in Pecs, and visit "Dracula’s" castle in Transylvania. Can't see the date you’re looking for? Call us for additional departure dates! Call us for cruise fare information! Go back to the days of World War II and the Cold War at the Sziklakórház ("Hospital in the Rock"), a museum recreating underground military medical and civil defense facilities in a former secret nuclear bunker hidden beneath Buda Castle. Explore the fascinating Christian Necropolis, a complex dating back to the 4th century that includes underground burial chambers and chapels adorned with early Christian art and frescoes. Dock in the Baroque city of Vukovar, once showcasing opulent 18th-century mansions, but now poignantly symbolizing the effects of the 1990s war as it rebuilds. You may choose to take a full-day excursion to Transylvania’s 14th-century Bran Castle, which Tepes once used as a fortress during his military campaigns; the excursion includes a brief walk and lunch in Brasov. Contact Natalie to book your cruise. 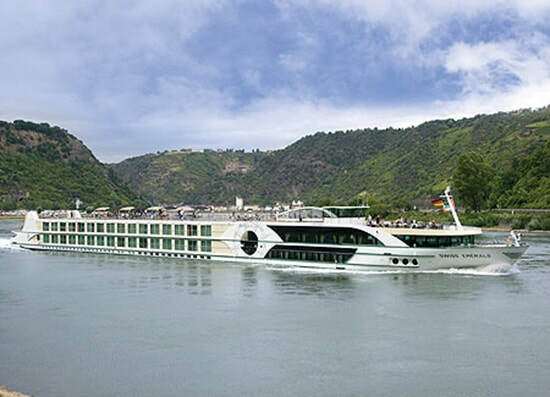 Cruise price per person includes cruise fare, most meals, port charges, wine with dinner aboard ship, shore ex­cur­sions, applicable fuel surcharges, and gratuities to Tauck Directors, Tauck Cruise Director, ship staff, local guides & drivers, as well as on all included meals. Unlimited complimentary beverages aboard ship now include regional wine, beer and premium spirits in addition to specialty coffee, water and soft drinks. Itinerary Changes – Although not expected, Tauck reserves the right to alter the sequence of ports or omit or substitute scheduled ports or attractions at any time without prior notice. Museums and attractions may be subject to closure due to state, local or religious holidays.